In general, the performing arts of Bali can be categorized into three: wali (sacred performing arts), which only made when the ritual worship; bebali performances are dedicated to the ceremony but also to visitors; and Balih-balihan nature for mere entertainment in public places. This categorizing affirmed in 1971 by the Advisory Council and Cultural Development (LISTIBIYA) Bali in response to increasing tourism to the show merambahnya arts sacred nature. This meeting recommended that caregivers and the arts that are not bebali dikomesialkan. Bandem and de Boer in his book Kaja and Kelod: Balinese Dance in Transition in detail to classify the various performing arts in Bali until the early 1980s. Belong to the trustee for example: Berutuk, Sang Hyang Dedari, Rejang and Row Gede; bebali such as: dance, Mask Pajegan, Wayang Wong; and Balih-balihan including: Legong, Parwa, Arja, Prembon, and Joged. Writing carefully about the Performing Arts Drama and Dance of Bali was first publicized in 1938. Ironically, and certainly not too surprising, that this book written by a stranger named Walter Spies and Beryl de Zoete. Is not a stranger intervention is already part of the history of Bali in general? Walter Spies, Peranakan Russian-German, was a foreigner who is very famous in Bali. He came and settled in Bali starting in 1927 until Jepeng occupation in the early 1940s, a musician, painter, who has a very deep interest in the performing arts in Bali. Role in the early development of cultural tourism in Bali is no doubt because he was trusted by a stranger who came to Bali at that time to provide cultural experiences, especially the performing arts in Bali. Traditional art performances became regular menu for visitors in the Age of that. Jaba staging performed in various temples (the outside of the temple) in various villages in the area around Ubud and also staging the Bali Hotel, owned by Dutch shipping company, KPM. It is conceivable that drama and dance performances are often not fully understood by tourists mainly because of language, in addition to general tourists crowded tour schedule.Therefore, interventions carried out by travel agents so that performances can be further shortened to a format that can be understood and enjoyed by tourists. Genres mixture begins to appear that combine with each other genres, such as Cak Ramayana story with a vocal blend of Sang Hyang Dedari made by Spies and a dancer named Limbak; or Barong and Kris dance with excerpts from the Mahabharata. Performances are usually lasted one hour. Besides, dances popping off (stand-alone dance, does not form part of the drama), and packages that combine a variety of dance performances from the genre off the mask, row, Legong, and others. Balinese performing arts sacred nature usually has a value exoticism and magical so sought after by tourists. There ketergiuran tourism service providers also offer packages then clone these sacred arts. 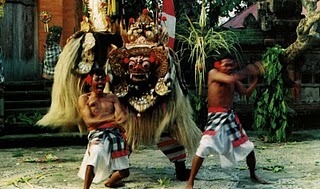 barong performance-Rangda with unying (kris dance) is one classic example profanisasi happened (See bandem and deBoer, 1981:145-150). Presumably idealism untuktidak guardian and commercialize dance bebali completely unworkable. Now for the performances have started to exhibit imitation pariwista dance Sag Dedari Hyang; Sang Hyang Jaran, Calonarang, and so forth. And the latter is a term developed a new packaging as a combined performance aspects of ritual prossi with various types of performances such as puppet shows simultaneously, dance smack flames, Joged tube, and performances during dinner in the form of Legong, a freelance dance barong dance and drama. Performing like this is often done in a package tour of the castle (palace) is a royal dinner as it did in the castle Mengwi, Kerambitan and imitated by other castles. Major hotels when organizing the convention or gala dinner show also frequently uses the new packaging. Market pressures to constantly offer something new eventually influence the creation of new types of performing.